Thank you to my favourite Australian magazine, delicious. as while reading the June issue I stumbled across the ‘Australian Flavours’ story on The Grounds in Alexandria, Sydney. The Grounds is a recently opened industrial chic space set in a former pie factory which is a cafe providing house-roasted coffee, freshly baked bread and pastries and kitchen garden all in one. I miss brunch and coffee at places like this back home in Sydney, although I’m sure it won’t be going anywhere for a while. I had to make the ‘roasted granola’ on page 88 from their recipe selection published which I adapted slightly with a more Canadian influence. I substituted sunflower oil for an organic virgin coconut oil to increase the flavour and health benefits. I prefer to use all organic products so the apricot was darker dried unsulphured apricots I also used half the amount of walnuts, no pepitas just sunflower seeds and more maple syrup and a little Fraser Valley blueberry honey. It was an easy transportable and sustaining breakfast we could enjoy at the cabin on Pender Island which was received well by all. This recipe will become one of my favourites. 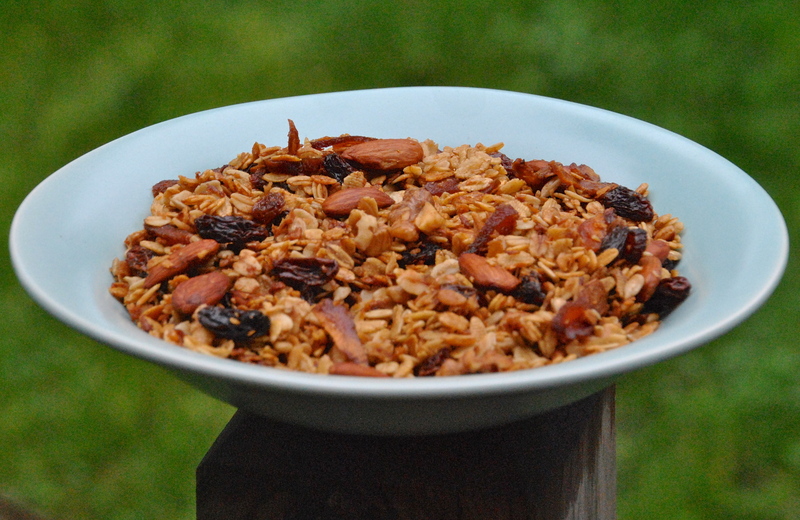 Roasted Granola (makes about 15 serves). 1. Preheat oven to 266 F / 130 C. Stir in coconut, oil, butter, syrup, honey and cinnamon in a small saucepan over low heat for a few minutes until combined. 2. Scatter oats, seeds and nuts on a baking tray and pour over syrup, stirring well to coat. 3. Roast for 1 hour, stirring every 15 minutes. Add fruit and cook for a further 30 minutes or until crisp. Remove and cool. Store in an airtight container for up to 1 month. Serving suggestion:- Taeberries and creamy yoghurt. 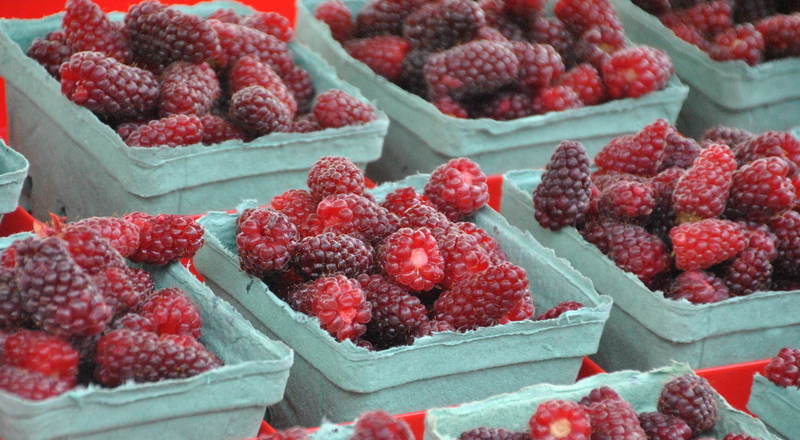 I discovered Taeberries at the local farmer’s markets on Pender Island, a blackberry-raspberry cross (similar to Loganberry). They are high in vitamin C and fibre and are a tangy sweet flavour. Next, I will try to do Pender Island justice by writing about our weekend away at our friends’ cabin. I now know why there are so many beautiful people in Vancouver…they are all obsessive about Kale! Vancouver is quite the active, healthy city and not only does it buzz and glow, the people do as well. There’s kale all over the grocery stores, on the menus in healthy take out shops/cafes, restaurants – if we didn’t know what kale was before arriving we do now! Kale has become so popular in BC that in some places it’s selling off the shelves within minutes. It also grows well here in the BC climate too, certainly preferring cooler conditions. This was certainly the case when my husband cycled up to the local nursery with my wish list of herbs and kale of course to plant at the time when I was told it was delivered; around midday on a Saturday. Around 1pm he arrived safely to pick up most of the green items on the list and more,(he loves tomatoes) with one item still pending…the kale! Much to his amazement, there was a sudden burst of commotion when he realised there was only one tray left! 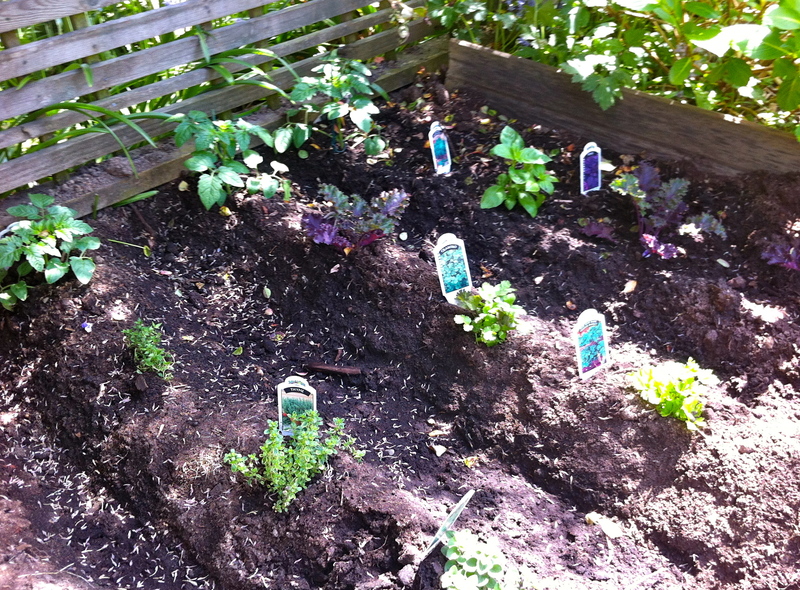 He was successful at picking up the last of it so it could journey to its new home – our new herb and vegetable garden. When trying to work out what to plant, I researched what grows well here in terms of climate, time of year, what’s easy (for novice gardeners like me) and what I use frequently that have real health benefits. I also want to ‘glow’ so I think Kale will need to be on the list. 1. Kale (redbor variety) – Has many health benefits, there are over 45 flavonoids in Kale which combine both antioxidants and anti-inflammatory properties. It is a detoxifying green and can provide cholesterol lowering benefits when steamed as well as it being extremely high in Vitamin K, A, C, manganese, calcium, many B group vitamins and more. The leaves have an earthy flavour and can absorb other flavours as well as being extremely versatile and nutritious green leafy vegetable to use in many different recipes. 2. Oregano – Is aromatic, can be added as a flavour enhancer to a large number of dishes and also is named as a ‘super food’ on many different lists I have researched. It is also high in vitamin K, why is K important you might ask? Vitamin K quite simply is a fat-soluble vitamin that helps protect your cardiovascular system (among several heart related benefits, K may help keep calcium out of your arteries). Oregano also has beneficial anti-bacterial and anti-oxidant oils in the leaves so much better to use the fresh variety. For the size of their tiny little leaves they are also high in minerals like iron, manganese and others important for health. 3. Flat leaf/continental parsley – Humble as it is, parsley also contains many anti-oxidant properties as well as a number of B group vitamins, A, K and C. The essential oil Eugenol has been found to reduce blood sugar levels in diabetics but further research is being done in the role it plays in cardiovascular health. The chlorophyll content in parsley can also counterbalance breath odour too. 4. Coriander/Cilantro – Is a fantastic detoxifying herb, known to help remove heavy metals and other toxic agents from the body. It has a positive effect on our inner digestive tract with antimicrobial properties as well. 5. Basil – Is wonderfully fragrant, and is easy to use in many dishes; especially mediterranean recipes. It also has many benefits, similar to some I have noted above and just tastes delicious! It also will help keep the mites away from our tomatoes so it’s a protector in our garden bed as well. 6. Thyme – Fresh leaves are packed with rich sources of potassium, iron and manganese. Thymol (an essential oil) in the leaves is found to have anti-fungal and antiseptic characteristics too. It is a versatile herb and great with staple dishes like potato, breads, cheeses, stuffing, soups and more. 7. Lemon Thyme – With its beautiful lemon scent, it makes an aromatic tea and also has decongestant and relaxant properties in this herb. It also suits risotto and seafood too. 8. Tomatoes – Are an outstanding source of lycopene. Lycopene is important for bone health, and the many antioxidants in tomatoes are great for heart and cholesterol health. It is very high in vitamins, C, A and K. There is a link for tomatoes lowering the risk for prostate cancer too. There are so many benefits of this fruit and most people love them – especially my husband, so they were really on his wish list! 9. Spearmint – The least pungent and subtly fragrant of the mint family, it also has good concentrations of iron, manganese and calcium in its leaves as well as vitamin A especially. It can help if you have a spot of indigestion or perhaps even a headache. It is easy to grow all year around and also makes for a great repellant to mosquitos and other insects! 10. A pea, my son’s pea – I’m not sure how big this pea will get or how many we’ll yield, but my son is intently watching the tub of soil each morning and night waiting for it to shoot out. I never ever liked peas when I was his age; well let’s say for about 25 years! Maybe, watching this pea grow will encourage him to eat his peas more often than not now. They are also an environment friendly food and classed in the “nitrogen-fixing” crops, taking nitrogen gas from the air and converting it into more complex and usable forms. So they are good for the garden as well as our tummies. The task of planting was left to my boys and they went about their work with great care of these little green babies. We will all nurture them each and everyday until they flourish. My job? To remember to water them and start working up delicious recipes to use them in! I am now working on my ‘Super Summer’ kale recipes.